Congratulations to our Newest PRI Director's Dedication Award Recipients! This past week, at our Annual Interdisciplinary Integration Symposium, we presented the PRI Director’s Dedication Award to two very deserving women who have had a tremendous impact on our Institute; Lori Thomsen and Jennifer Poulin. The PRI Director’s Dedication Award was established by the Board of Directors (Ron Hruska, Janie Ebmeier, Jennifer Platt and Bobbie Rappl) in 2012 to recognize individuals’ ongoing dedication to their advancement in PRI. Past PRI Director’s Dedication Award recipients include: Susan Henning and Joe Belding (December 2012); Kyndall Boyle and James Anderson (April 2014); Michael Cantrell (December 2014); Jason Masek (April 2015); and Michal Niedzielski (December 2015). An award recognition plaque is currently being designed and constructed, and will be displayed at the Postural Restoration Institute®, recognizing each of the PRI Directors Dedication Award recipients. Lori Thomsen graduated in 1995 from the University of Nebraska Medical Center with her Masters in Physical Therapy. She was first introduced to PRI while working at RiverView Health in Crookston, MN in 2003. Lori was a member of the 2005 Postural Restoration Certified™ (PRC) class. Lori spent countless hours with Ron Hruska helping to organize and structure the Pelvis Restoration course, and joined the PRI faculty to begin teaching this course in 2010. Lori is a teacher at heart, both with her patients as well as colleagues in her PRI courses. You will see this demonstrated in the many videos, articles and blogs she has created over the years. Jen Poulin graduated in 1991 from the University of Vermont with her Bachelors of Science in Physical Therapy. She attended her first PRI course (Protonics) in Burlington, VT in 2001. Jen and her husband Chris opened Poulin Performance and Rehabilitation in Burlington, VT in 2002. Jen was also a member of the 2005 Postural Restoration Certified™ (PRC) class. In 2012, Jen and her family moved to Southern Pines, NC and opened Sandhills Sports Performance, where their staff continues to grow, as they mentor them with PRI. After expressing her interest in teaching PRI to Ron, Jen joined the PRI faculty in 2009, teaching Myokinematic Restoration, and Pelvis Restoration beginning in 2013. Thank you Lori and Jen for your ongoing dedication to the Postural Restoration Institute®, and congratulations on receiving the PRI Director’s Dedication Award! On a sunny Sunday in June, the staff at Advance Physical Therapy in Chapel Hill, NC invited second year physical therapy students from UNC Chapel Hill to attend a screening for treating pain and dysfunction using Postural Restoration. The experience produced many and varied positive outcomes for all involved. We thought other PRI clinicians might like to know what we learned. On the students: I teach PT students annually each spring. Inevitably this endeveour culminates in a line of young, high achieving, overworked, overstressed, mostly PEC’s at my door. Further, after years of attending courses within the institute, it seems the most dysfunctional and complex patients are often the PT’s sitting around me. We ourselves realize the profound benefits of PRI most when we feel the effects personally. As with PT practitioners, when PT students are offered plausible mechanisms for their chronic painful states, and more when they are changed by PRI, openness to the approach is enthusiastic. Working with students in this way seems powerful toward the PRI paradigm shift we would like to see within PT. The students also offered helpful feedback with regard to comparing different clinician handling for PRI tests. On our clinicians: With 12 willing student subjects in the clinic, we couldn’t resist the temptation to try a bit of inter rater reliability among our clinicians for 3 basic PRI screening tests: Adduction Drop Test (ADT), Humeral Glenoid Internal Rotation (HGIR) and Cervical Axial Rotation (CAR). repeated testing influencing test results? On our clinic as a whole: All together at a follow up meeting, we watched each other do these same tests, this time on one subject, to discuss our individual thinking without the “blinding” we employed with the students. In the end we discovered we each employed unique positioning and preferences for support. Our collective descriptions, thinking and rationale for ratings were insightful and got us all looking more creatively about our own process with a greater likelihood of being in the same neighborhood, if not exactly the same page as our fellow PRI clinicians. Hruska Clinic's Jason Masek "Redefines Hip Impingement"! Straight out of the Hruska Clinic, Jason Masek's third article will be published in the Co-Kinetic (formerly known as SportEX) April 2016 issue, as well as online at https://co-kinetic.com/#_l_5w. Check out a preview!! online at the Hruska Clinic Blog or on our You Tube Channel. The following article was inspired by the book, The Brain’s Sense of Movement by Alain Berthoz and the concepts taught by the Postural Restoration Institute (PRI). The purpose of this narrative is to explore the multisensory nature of PRI. Traditionally, we presume that the goal of our PRI interventions is to create postural changes and thus function via first repositioning to achieve positional and neuromuscular neutrality by decreasing the dominant L AIC/R BC/R TMCC lateralized pattern, followed by retraining the body to be able to fully appreciate the submissive R AIC/L BC/L TMCC pattern, and finally restoring authentic reciprocal alternation between the two. This ultimately means the ability to walk and breathe utilizing all 3 planes of motion as well as have the movement variability capacity to experience other potential functional strategies of these synergistic patterns such as sports performance activities or simply carrying an object while walking. Within this paradigm, we tend to think about inhibiting specific chains of muscle (members of the L AIC/R BC/R TMCC) while facilitating the opposing R AIC/L BC/L TMCC neuromuscular synergistic pattern. More details of these chains and their composition can be found at https://www.posturalrestoration.com/the-science. Depending on an individual’s specific patterns and where they are in their restorative process, some of these chains and plane of function (meaning sagittal, frontal, and transverse) may need to be emphasized more than others. However, the bottom line is that PRI practitioners are mainly considering within their treatment rationales which chain(s) of these synergistic patterns of neuromuscular function need to be inhibited/facilitated and the corresponding plane of emphasis. Again, this is all for the goal of efficient and effective movement. In my recent previous article (http://www.posturalrestoration.com/community/post/2633/biasing-bilateralism-with-unilateral-sensory-and-manual-integration-by-heather-carr?id=2633), I discussed the interrelated somatosensory nature of neuromuscular function. This means that the brain is programmed not only to simply facilitate or inhibit various agonistic and antagonistic chains of muscle but that this mechanism is accompanied by the ability to also sense and feel these contractions, accompanying body segment positions, and movement relative to each other. To be more specific, our somatosensors (such as tactile, proprioceptive, and kinesthetic receptors) are feeding the brain information regarding position, velocity, and acceleration. In PRI, we refer to these as reference centers. PRI teaches 6 key ones (as described in the Impingement and Instability course) that when one has the ability to sense they most likely can also simultaneously engage the corresponding desired neuromuscular chains and hence movement patterns for better function and performance. The brain does not aim to separate motor from tactile, proprioceptive, and kinesthetic processing but needs all of this information for proper motion. In cases where there is impairment here, such as with a stroke or peripheral neuropathy, movement capability can become significantly dysfunctional. Let’s take this a step further. When processing somatosensory signaling, the brain concurrently needs other sensory signals that are crucial for desired movement goals. This includes vestibular, visual, and auditory reception and thus perception. The vestibular receptors provide critical information to the brain such as where the head is oriented with respect to gravity, its velocity and acceleration, as well as the plane of its motion. In fact, the semicircular canals are organized in 3 perpendicular planes with one another which enables the differentiation between sagittal, transverse, and frontal vectors of head movement. This triplanar architecture is reflected in the subcortical areas where the 3 dimensional directional information is retained and further integrated with visual, auditory, and somatosensory signals. Furthermore, muscles are represented in the brain by their “eigenvectors”, their own virtual vectors that convey the amplitude of force exerted by each muscle and its corresponding plane of action. There seems to exist patterns of redundancy with the orientation of the planes of the semicircular canals to how the brain processes 3 dimensional movement and position to enable more consistent sensory processing. For example, the three pairs of extraocular muscles are approximately parallel to the planes of the semicircular canals likely making it easier for the brain to reconcile triplanar multisensory information. What is important to understand is that without the merging of ALL the sensory information, the brain will not be able to completely know its position and movement with respect to itself, the ground, and other objects. For example, without synchronized signals from both the visual the vestibular systems, the brain wouldn’t be able to tell whether the body and/or the environment is moving. Without appropriate integrated tactile, proprioceptive, and kinesthetic signaling, the brain has no idea where its body segments are positioned relative to the head and the ground. Without proper visual processing, the body loses information regarding orientation of the position of self with relation to the environment coupled with reduced direction, speed, and acceleration of movement signaling. Furthermore, the auditory system also provides information regarding environmental space as patterns of sound are detected and contribute to an individual’s orientation relative to their surroundings. In sum, postural positioning and movement with respect to the self, ground, and other objects is dependent on all of these sensory signals. Not only do we need authentic sensory signaling from the vestibular, visual, auditory, and sensorimotor systems but this information must be perceived by the brain in a coherent manner. Thus the term, “neurosensory coherence,” describes this phenomenon. There are certain parts of the brain such as the superior colliculus, cerebellum, and lateral geniculate nucleus of the thalamus that are especially important for merging these signals together and communicating with around 20 other brain structures. In fact, these sensory pathways are so intertwined that some neurons can respond to different types of sensory receptor signals. For example, 2nd order vestibular neurons fire from both oculomotor and neck efferent signals as well as incoming afferent vestibular, visual, and proprioceptive signals. Some bimodal neurons can be fired with either visual or tactile input and thus can create the same perception. The visual stimulus of a finger moving to touch one’s face can be perceived as actually touching the face without real contact due to the overlapping tactile and visual receptor field function. Some cases of hemi neglect have shown that injection of cold water into the ear and thus stimulating the vestibular system can temporarily alleviate symptoms of neglect including hemianopsia (seeing only ½ of a visual field) and/or hemianethesia (reduced sensation on ½ of the body). Likewise, somatosensory stimuli (example of transcutaneous electrical-stimulation) as well as visual stimuli (such as prism glasses) can also reduce symptoms of neglect. What this means is that a somatosensory stimulus can simultaneously be perceived as a somatosensory, vestibular, or visual stimulus and vice versa. The somatosensory primary cortex seems to have no preference for the various sensory inputs. There are a variety of neurosensory patterns in the brain that can all contribute to neurosensory perception and body schema. Therefore, movement ultimately creates and requires a symphony of somatosensory, visual, vestibular, and auditory sensory signaling that must be properly synchronized, merged, and modulated together with other cortical and subcortical discharge. When this neurosensory coherence occurs, desired and efficient movement is permitted. Therefore, in cases where this is not occurring the clinical dilemma involves figuring out which sensory system(s) to manipulate to achieve the desired functional outcome. Within the paradigm of PRI, we assume an inherent asymmetry and lateralization of the postural system. However, based on the information presented in this article, I hope you are now also assuming this includes an asymmetrical and lateralized sensory system. Once again, the brain merges all of this information together for processing posture and movement modulation. The brain is actually constantly checking to see if how it predicted position and motion was indeed perceived as accurate. Furthermore, this information is not just being used to only put us in certain positions and permit movement but also is concurrently telling us where we are located in space relative to the ground and peripheral environment. Movement is orientation and orientation is movement. For example, the brain regulates the firing threshold of a motor neuron. This threshold (meaning how easy or difficult it is to fire) is influenced by the position of the body part and thus also has a spatial dimension within it. Considering both the agonist and antagonist facilitation or inhibition tendencies (think PRI patterns), these thresholds convey spatial information because of their correlation to different body segment angles. This is one of the main principles that PRI non-manual techniques are based on. We are attempting to encode new threshold relationships between agonists and antagonists in synergistic patterns in specific positions which concurrently encode new spatial patterns with vestibular, visual, and auditory frames of reference. To help understand this concept even more, wherever you are right now pause to do the following: Acknowledge the position you are in and how this feels. For example, if you are sitting where do you and don’t feel pressure? What angles are your body segments at? Can you sense whether your body is leaning or rotated in a particular direction? Are you moving? Are you on an object that is moving (car) or are you moving on an object (walking on the ground)? Are objects moving around you (cars or people)? What sounds do hear? Are they coming from far or near? Now for the punchline: ALL of what you just experienced, including what you see and hear is YOU. Not only is your body but also what you perceive beyond your personal space is YOU. It is YOUR NEUROSENSORY WORLD. The question then becomes: is your neurosensory world coherent on both sides of not only your body but also SPACE which includes the visual and sound fields? If you exist in a lateralized body and world, you therefore not only posture and move differently on each side but you also perceive space such as the ground, gravity, objects, and sound asymmetrically as well. PRI practitioners are typically trying to teach our patients and clients to position and move in new ways to become less lateralized. However, in reality we are also simultaneously teaching them a new orientation and perception of space. Therefore, when you are working with your patient or client, try to imagine their entire neurosensory world (as you just practiced) and perceived reality. This “imagination” of neurosensory perception is what Ron Hruska bases his neurosensory decision making recommendations on. He interacts with patients to figure out how best to modulate their neurosensory world to achieve authentic reciprocal alternating body and space coherence. In conclusion, the L AIC/R BC/R TMCC dominant pattern promotes a neurosensory illusion of being half lost in space and body. Therefore, when you are instructing your patients and clients in a PRI technique, consider not just the specific muscles and plane you are trying to inhibit or facilitate but also the corresponding sensory pieces to them. Many of these aspects are already in the techniques whether you realized it or not. Basically, any time you reposition the postural system you are concurrently reorienting its perceived space. Consider what other sensory mediums you can use to achieve this. This is why the Postural-Visual Integration course is so powerful because it emphasizes the visual aspect of our space which is a huge piece of our neurosensory world. I am really looking forward to learning how the auditory system can be engaged to instill coherent space and body function at this spring’s annual symposium……. Last week I had the opportunity to take Advanced Integration for the 2nd time followed by 2 days of PRC testing. I found the experience to be extremely beneficial in enhancing my PRI philosophy and skills while also further engraining my connection to our special community. I highly recommend going through this process to those who believe in continuing to expand their PRI methodology and horizon. The journey of taking the required classes, completing the application, preparing for certification, and finally going through testing is a huge learning experience. Completing this endeavor not only demonstrates a certain level of competence of PRI but further develops your relationship with the institute and peers who will always be a significant pillar of support for you. I regard us as a family. Because I care so much about PRI and its valuable clinical application I thought it would be helpful to my fellow PRI practitioners to share a couple important take home messages that I gleaned from last week’s experience coupled with my 2 years of PRI based clinical practice (not sure if I can count the prior 12 years….) I hope that this knowledge will help others to have more efficient and effective outcomes utilizing PRI’s powerful and unique approach to system integration. Please let my struggles become your success. Let’s start with the concept of “Biasing Bilateralism.” I can remember back to when I first took Pelvis Restoration and learned about the “PEC.” This is the individual who has both AIC chains locked up coupled with excessively facilitated back extensors (usually R>L). This pattern may also parallel a bilateral BC and/or bilateral TMCC. At the time, I was really excited to learn about this bilateral phenomenon because it seemed like the majority of my patients presented this way. Most of my patients had both legs that would not adduct, arms that would not internally rotate and horizontally abduct, and posterior mediastinums that would not expand. Thus, I readily complied with the PEC algorithm and began doling out a lot of Modified All 4 Belly Lifts, Squat and Reaches, 90/90 Hip Lifts, Short Seated Balloon Blowing, etc. The problem with this was that many of these individuals were still not transitioning into a L AIC/R BC/R TMCC (unilateral) pattern despite my persistence at inhibiting their bilateral posterior mediastinums and posterior outlets while facilitating their left and right zones of apposition in the sagittal plane. After I took Advanced Integration last year and listened to Ron speak about the necessity of our system to serve as a pump (to push gas, solids, and liquids) I decided to try to apply this concept to my PEC patients. I figured out that if I had my PECs pump their rib cage during bilateral flexion based exercises I got better results. Pumping means I had them do alternating reaching coupled with inhalation and exhalation (R/exhale and L/inhale seemed to work best and is consistent with PRI’s breathing/reaching patterns). I used short seated, all four, 90/90, supine hooklying, and squat positions for the pump activities. I was going rogue in terms of the PRI algorithm and having non-neutral individuals do alternating frontal and transverse plane rib cage movement to reduce extension tone. Even though this alternating motion was not truly authentic (meaning the performing individual did not yet have true full reciprocal motion in all planes) it helped many of my “stuck” PECs to get out of their bilateral sagittal world to either a L AIC/R BC/R TMCC pattern or in some cases actual neutrality. Once they achieved either of these patterns I would then return to the traditional PRI algorithm for further progression. Even though the pumping was helpful at getting a lot of my bilaterally patterned patients to shift into a unilateral pattern or even neutrality I was still having trouble getting others to change. Thus my first take home message from this past week of PRI extravaganza: Bias your bilaterals! What this means is that when you are doing your bilateral posterior mediastinum/outlet/capsule inhibition and zone of apposition facilitation activities put a twist into the mix. For example, get them to flex and sidebend more on the left compared to the right (thoracic flexion and L abduction), bias them more into L AF IR, have them be more aware of their left periphery, and/or see if they can find their left canines, etc. If you are already choosing a platform activity that puts them into flexion they are less likely to kick in their extension tone when performing the activity. These techniques are still addressing the bilateral extension problem but are also tailored to the underlying asymmetrical extension pattern. Because these individuals are existing in a sagittal reality and are deprived of tri-planar movement variability what they really need is a stimulus to allow them to sense a change to bring them out of their one dimensional existence. They need to experience something different to get their system to shift. They also have to want and see a purpose for making this change but that’s another story… Furthermore, if while performing a unilaterally biased flexion based activity and they do indeed end up undesirably compensating you always have your PRI tests to fall back onto. That way even if you don’t see any extension while they are performing the technique you can always rely on your tests to tell you what really happened. We now come to the next part of my take home message: Use unilateral sensory integration to bias your bilaterals! As was just explained, we can position our patients when performing their exercises to simultaneously address both the bilateral and underlying unilateral extension pattern. However, when actually executing these techniques to get certain chains of muscles to become more active and others less active you can’t forget about the sensory component to these sensory-motor techniques. In other words, you cannot separate motor from sensory. The brain needs both! What this means is that even though you may be setting them up to perform the exercise perfectly from a biomechanical perspective (which enhances the proprioceptive aspect) you also have to make sure they can actually feel what you are trying to get them to do. For example, do they feel their left basal anterior ribs move down, in, and back? Do they feel their right anterior apical ribs and left posterior apical ribs expand? This concept of sensory “reference centers” is discussed in depth in the Impingement and Instability course but focuses more on the extremity reference centers such as the left heel, right arch, left glut med, etc. This past week, it became even more crucial to me of not only the need for tri-planar rib cage movement but for this motion to be coupled with a parallel sensory awareness of it. From a clinical perspective, if someone is having difficulty moving and feeling their rib cage with a non-manual activity that is biased towards unilateralism the next step would be to incorporate a manual technique. Similarly to what was explained in the previous paragraph, the purpose of a manual technique is not just to provide increased mobility capacity of connective tissue but also to develop increased sensory awareness of that tissue. Therefore, consider PRI manual techniques to really be motor (breathing component utilizing the diaphragm and abdominals) as well as sensory (manual sensory contact coupled with the kinesthetic perception of rib cage movement and muscle activation). Once again, you cannot separate motor from sensory. Therefore, while performing your manual techniques I suggest cueing your patient to engage with you from a kinesthetic perspective. Can they sense their ribs moving in a particular direction? Are they aware of their internal obliques/transverse abdominus (with a left bias) activating? This brings us to my final concluding point which is to regard manual techniques as both a sensory and motor application to bias your bilaterals as well as integrate your unilaterals. When we consider the core PRI manual techniques they are inherently asymmetrical in nature to reflect this natural human phenomenon. They are already unilaterally biased and thus designed for our asymmetrical design. Thank you Ron Hruska! Congratulations to the PRC Class of 2015! We are excited to announce and congratulate the Postural Restoration Certified (PRC) Class of 2015! PRC credentialing is the result of completing multiple advanced PRI courses, demonstrating a thorough understanding of the science through completion of the PRC application, and successfully participating in practical and analytical testing. Twenty Physical Therapists and one Chiropractor earned the designation of Postural Restoration Certified (PRC) under the direction of Ron Hruska, James Anderson, Mike Cantrell, and Jennifer Platt earlier this week. The Postural Restoration Institute established a certification process in 2004 as a way to recognize and identify those individuals with advanced training, extraordinary interest and devotion to the science of postural adaptations, asymmetrical patterns and the influence of polyarticular chains of muscles on the human body as defined by the Postural Restoration Institute. The PRC credentialing program is available to physical therapists, physical therapist assistants, occupational therapists, and chiropractors who have attended PRI courses, demonstrated a thorough understanding of the science through completion of the PRC application, and successfully participate in both clinical and analytical testing. 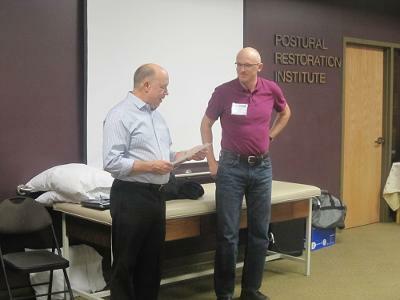 To date, 159 professionals have earned the designation of Postural Restoration Certified (PRC). Pictured from left to right (back row): Mike Cantrell, Chad Moreau, James Anderson, Martin Higgins, Joe Cicinelli, Trevor Rappa, Connor Ryan, Lori Hefta; (second row) Jennifer Platt, Carolyn Weber, Joy Backstrum, Cathleen deSmet, Frank Mallon, Kari Koos, Christopher Roosa, Greg Spatz, Matthew Varca, Karen Hoyt, Ron Hruska; (front row) Nancy Hammon, Stephanie Irizarry, Carol Keren Cahn, Heather Carr, Jennifer Smart, and Manny Kim. At our annual Advanced Integration course this weekend, we presented the PRI Director’s Dedication Award to another very deserving colleague, Michal Niedzielski. This award was established in 2012 to recognize an individual’s ongoing dedication to their advancement in PRI. Michal attended his first course (Protonics) in 1998 in upstate New York, and since that time he has attended a total of 22 courses! He earned the designation of Postural Restoration Certified (PRC) in 2007. In 2009, Michal taught one of the first international PRI courses, Myokinematic Restoration in his home country, Poland. Since then he has continued to teach courses in Poland nearly every year, and in the past two years, he has translated and taught the Postural Respiration and Pelvis Restoration courses as well! Thank you Michal for your ongoing dedication to the Postural Restoration Institute®, and congratulations on receiving the PRI Director’s Dedication Award! If you haven't read it yet there is a new blog up at the Hruska Clinic website about how PRI activities create new movement patterns, and what may be an issue if it doesn't stick. Also the word mnemonic is used for all you spelling bee champions. Click here to check it out! Many patients with an active R TMCC pattern will need disclusion of the teeth to inhibit the TMCC. In my practice, our go-to resource for that inhibition occurs via a lower mandibular bite splint. Click on this link to see part 1 (of a 3 part series) http://caugheydds.com/clear-thin-strong-splints/ of a step-by-step file on how we build our splints clear, thin and strong. "Femoroacetabular impingement: Mechanisms, diagnosis and treatment options using Postural Restoration. Part 2" written by Jason Masek, PT, ATC, CSCS, PRC has been published in SportEx. For more information or to purchase a copy of the article, please visit www.sportex.net. To receive 20% off your purchase of the article, you can use the coupon code: 20AUTHOR. Part 3 of this three part series will likely be published in October.